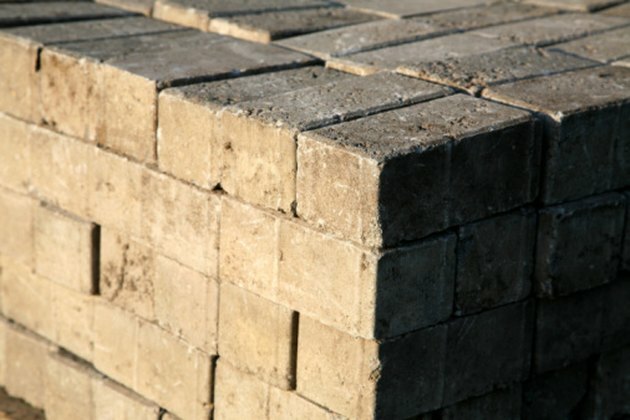 Casting your own paving or veneer bricks from concrete can save you money, but commercial molds are expensive. Making your own brick molds is easy and a lot cheaper. Since it allows you to make lots of molds, you can cast more bricks at once, which can cut weeks or months off your project time. Making your own brick molds makes it even less expensive to cast your own bricks. Seal the inside of the box with acrylic spray sealer if it is made of wood or other porous material. Allow the sealer to dry thoroughly. Arrange the bricks in the bottom of the box. They should be an inch away from each other and an inch away from the sides of the box. Spray the exposed surfaces of the bricks with acrylic sealer and allow it to dry thoroughly. Then paint the exposed brick surfaces and the exposed inner surfaces of the box with liquid mold release, using a paintbrush. Mix the two-part pourable urethane in a clean bucket according to the manufacturer's directions. Then pour the urethane over the bricks, up to one-quarter of the way under the upper edge of the box. Allow the urethane to cure to full strength; this usually takes between one and four days. Invert the box to release the urethane mold. Pull the bricks from the mold. Clean away any brick dust that may be clinging to the mold.